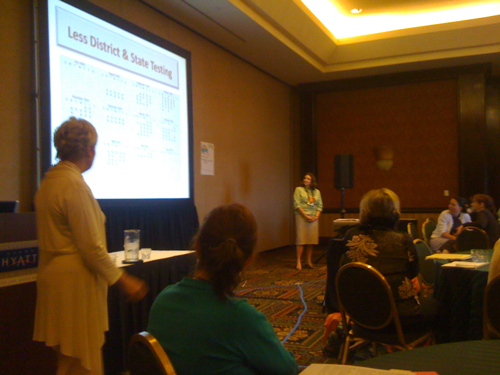 The national conference for math supervisors ended just as the national conference for math teachers began. No breaks. Let’s jump right in. Making Mathematics “Real.” Donald Saari. Making Math Much More Accessible to Our Students. Steven Leinwand. 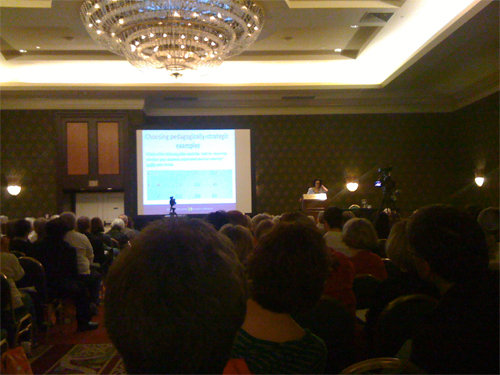 Leinwand modulated his earlier remarks nicely from a crowd of supervisors to a crowd of teachers — many more charts, data, and citations in his session with the former; a pep rally grounded in examples of classroom practice with the latter. That’s it. If a student comes up with a method for solving a problem that’s functional but outside the scope of your plan, let the plan go. Bring that student to the front of the class to explain her method and throw all kinds of enthusiasm at her. We [the US] need innovation. Who’s going to innovate but the kids who look at things differently. If we continue to teach math the way we have taught it, we will continue to do right by the same thirty kids who think like nerds. It’s even better to put students in a place where non-standard solutions aren’t just appreciated, but inevitable. Here’s one of Leinwand’s examples. Let’s say you want to chat about subtracting whole numbers. Sunil has 73 marbles. Jacinda has 63. How many more marbles does Sunil have than Jacinda. 73 and 63. Tell me everything you can about them. And when someone tells you (among a bunch of other fun facts you didn’t anticipate) that 73 is ten more than 63, ask your students to convince you. Saari brought in toilet paper to describe limits and apple cores to illustrate integrals. Leinwand used a recent experience with a highway patrolman to motivate evaluating expressions. Suffice it to say I would’ve stuck around for another sixty minutes if he had decided to elaborate on that casual disclaimer. Not that you asked but I think one of the largest challenges facing a new teacher is to establish certain practical habits such that her entire life becomes an ongoing 24/7/365 exercise in curriculum development. Because high-achieving, curious, capable students always, for whatever reason, seem to study with those teachers. Because that lifestyle will turn your classroom teaching into a daily act of creative expression, “a personal delight,” as Saari put it. Because it’s incumbent on human beings to live lives of fascination and to share that fascination with others. 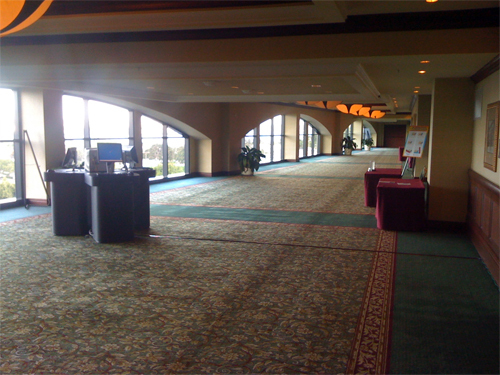 This so-called cyber cafe was the beginning and the end of free Internet access at NCSM 2010. It was like the fall of Saigon around there. Basically. Lessons Learned in Leadership for Classroom Change. Judy Kysh, Diane Resek. Coaching Teachers to Ask Questions That Provide Just Enough Help to Move Students Forward. Denisse Thompson, Charlene Beckman. Learning to do Mathematics as a Teacher. Deborah Loewenberg Ball. What Is A Rich Math Problem? … is mysterious, and the mystery is mathematical. … has very little overt scaffolding. … is accessible. All students can learn and build on what they know. Students need to experiment and fail productively. Teachers want to be helpful to their students so they run around protecting them from failure. But you learn by failing. Failing is a productive thing. Mathematicians need a big wastebasket. Test scores can improve by teaching less. How Do You Teach Teachers To Anticipate Student Thinking? Such a great title here: Coaching Teachers to Ask Questions That Provide Just Enough Help to Move Students Forward. So ask them to justify every step, not just the wrong ones. Or at least ask them to justify enough correct ones so that your request for justification becomes a meaningless predictor of the rightness or wrongness of an answer. In order to provide nuanced feedback, it becomes really important to acquaint yourself with all kinds of routes (mistaken and correct) through a problem. We were at thirteen tables. We were all given the same problem. We worked through it in different ways and then passed our answers around, examining another group’s work on our table like a coroner pokes at a dead body on a slab. This was a useful exercise. This was a monster presentation. Just incredible. I couldn’t stop tapping away. Looking back through my notes, I find it hard to believe she pushed through that much material with so much nuance. … become mathematically agile on her feet. Can you quickly analyze and remediate a correct answer that came about from incorrect computation? All of these students have the right answer. 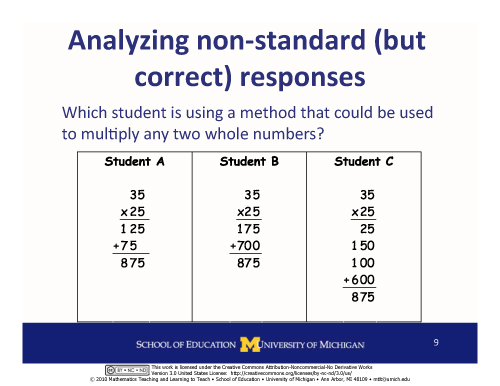 How do you nudge those students towards a generalizable method? 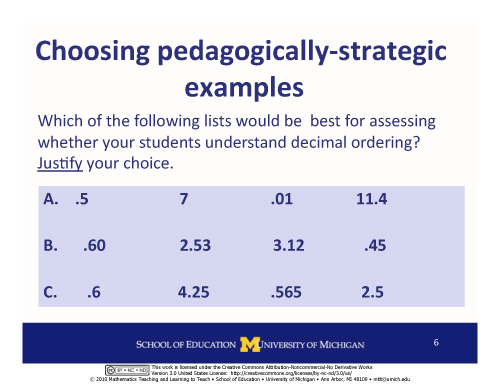 … choose pedagogically strategic examples. The answer is [c]. Does anyone want to take a swing at the rationale in the comments? … develop sensibilities about mathematical language, including a realization that not everything in K8 education needs a definition and an awareness of the overlaps and conflicts between math language and everyday language. If a student defines a rectangle as “a shape with four square corners that’s flat and closed all the way around,” is she wrong? Will that definition lead to undesirable complications later on in her learning? If you ask a student to define a “polygon,” will you accept anything less formal than “a simple closed plane curve composed of finitely many straight line segments.” How much mathematical fidelity will you sacrifice in order to exploit your students’ everyday vocabulary. Given the remedial populations I teach, it shouldn’t surprise you to learn that I tilt towards familiar language as a starting (though not an ending) point, though I feel the tension along that rope all the time. … recognize how subtle alterations in the wording of a problem drastically alter the mathematical work required to solve it. I have pennies nickels dimes in my pocket. If I pull out two coins what amounts of money might I have? I have pennies nickels dimes in my pocket. If I pull out two coins how many combinations are possible? I have pennies nickels dimes in my pocket. If I pull out two coins how many how many different amounts of money are possible? Prove that you have found all the amounts that are possible. Along these lines, I’d like to recommend Kate Farb-Johnson’s analysis of math assessments that test students’ reading more than their math. Here are DLB’s slides. Find the video of this talk. 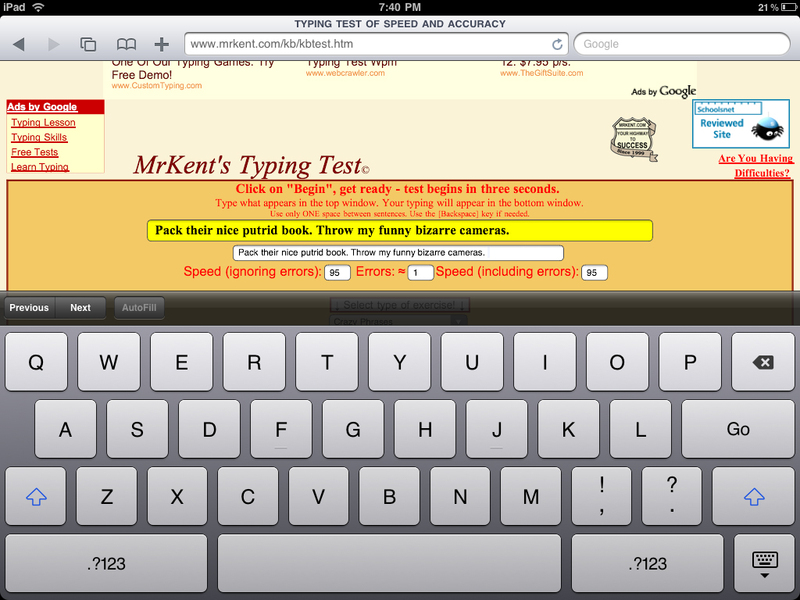 I need to teach a class on iPad touch-typing. Steve Jobs could be my TA. Seriously. Three days of non-stop notetaking is all this thing took. If I take my eyes off the screen, though, I fall apart. 95 wpm at a sprint. Seriously. A Lesson Study Project: Connecting Theory and Practice Through the Development of an Exemplar Video for Algebra 1 Teachers and Students. Anne Papakonstantinou, et al. 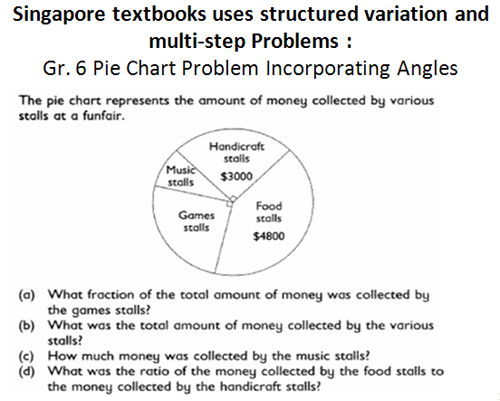 Intriguing Lessons About How Math Is Taught and Assessed in High Performing Asian Countries. Steven Leinwand. Problem Solving and Technology implementation in an Inclusion Classroom. Annie Fetter. Western Caucus. California, Hawaii, Oregon, Washington. Houston Independent School District is huge. It won a huge grant and has a huge video production department. It created an impressive DVD of impressive practices in Algebra I and the teachers who participated in that reflection program improved impressively. How can we distribute the work of editing and mastering these videos? What is the least cost we can get away with for a hardware / software package for a classroom? Specifically, what is the sweet spot where quality meets affordability? How do we communicate this transparency mandate to parents? Specifically, how do we streamline the legal release process? Those questions weren’t addressed. Which was fine. It wasn’t my session. Nonetheless. The presenter, Annie Fetter, has been creating Problems of the Week for the Math Forum since 1993. She’s reviewed thousands of student responses in that time and she now models problem-solving techniques for other teachers in their classrooms. There was one mortifying moment in the session and a whole lot of great ones. Greta has a vegetable garden. She sells her extra produce at the local Farmer’s Market. One Saturday she sold $200 worth of vegetables — peppers, squash, tomatoes, and corn. You know where this went for me. Honest to god I tried to stay cool. I asked my table buddies, “Is this problem contrived? Is there a more natural way to teach systems of equations?” The guy across from me just glared back like I had said something derogatory about his mother. That sort of response triggers my instinct for self-preservation. I start looking for a desk to duck beneath. If I pitched that response to my students, they’d already have their knives out, sharpened, and thrown. Is there a situation where it makes sense to use systems? Did mathematicians develop systems because they makes life easier, more fun, or more meaningful? Or are they just arbitrary symbology we use to limit access to universities? A particularly sweet grace note on noticing / wondering. Give the student a mathematically rich situation but don’t yet give them a question. If you give your class a specific line of inquiry and even one student chases it all the way to the end, the moment has passed for the novice problem solvers. What moment? The moment where “we get students out of the gate who can’t usually get out of the gate.” ¶ So we take that moment away. “Find all the math here.” Then the classroom superhero will expand in every direction not just along the one. You take offense at least once in his talk — either by his tone or by a rhetorical overreach. He will be the most well-researched speaker you see that day. In particular, he has an encyclopedic knowledge of the content standards and assessment questions of countries in the East and the West. He noted right away the irony of totalitarian eastern countries assessing their students more constructively than their democratic counterparts in the West. What is the approximate thickness of 1,200 sheets of paper? What is the approximate number of classes that may be formed by 1,200 students? What is the approximate length of 1,200 footsteps? Estimate the number of characters contained in one whole page of a newspaper. “The National Math Panel report was a complete and total disaster.” So there you go. “I do this [present at conferences] to entertain myself and I’m surprised whenever anyone comes.” Naturally the hall is packed. “The Common Core math standards are what we’ve been praying for for a generation.” He anticipates improvements in the next draft. “By 2014, we’ll have a national test in the 4th, 8th, and 11th grade. It will be on a computer and feature both constructed response and multiple choice. 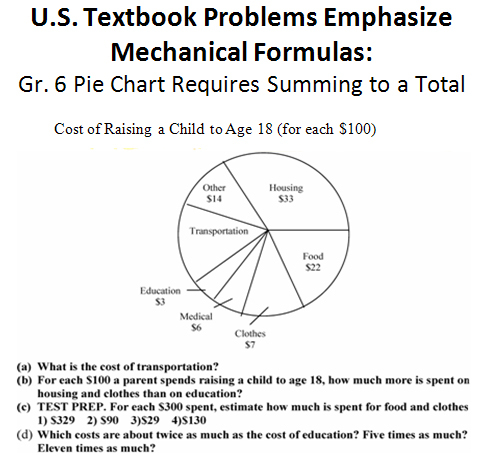 Students will have a four-week window to take it, two weeks after which they’ll release 75% of the questions and data to all stakeholders.” By “constructed response” he referred to a problem where a student saw two egg rolls on a screen and had to drag a knife around with the mouse, clicking to create cut lines to show how to feed three people equally. He noted the inequities in models of teacher development between the East and West that made adopting the eastern model of student instruction difficult. 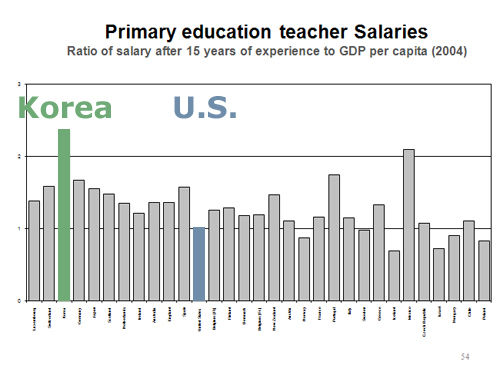 In Korea, for instance, the ratio of teacher salary after fifteen years to GDP per capita is 2.5. 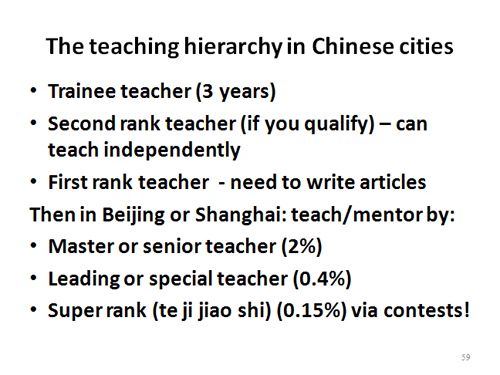 The Chinese, meanwhile, apply a model to teacher training that looks suspiciously like medical residency. Math supervisors from California, Washington, Oregon, and Hawaii gathered together in a room to update each other on old and new business. We stood one-at-a-time and introduced ourselves. Caucuses strike me as a relic of an age when you couldn’t e-mail or otherwise connect instantaneously with your long-distance colleagues. I’m not saying they aren’t useful or even fun but it will be interesting to watch these stodgy national organizations try to persuade young members of that usefulness. Auto correct is still confounding. It’s an attention-getter. Leinwand accused me of buying it just to make friends. I love the sound of typing, or rather the lack of sound. There’s always some guy in a session clattering away noisily and unselfconsciously on his laptop. The iPad “keyboard,” meanwhile, is whisper quiet. I decided against the typical liveblog fragments here. I took some time, instead, to synthesize the major events and themes of NCSM (for math supervisors) and NCTM (for math teachers) so they’ll be more useful to me later. If you’d like me to elaborate on anything I cut short, just let me know in the comments. This delay has also given me time to request supplements from presenters (slidedecks, works cited, handouts) and link them here. Charting a Course with Professional Learning: Coaching to Promote Mathematics Education Leaders. Nan Dempsey. 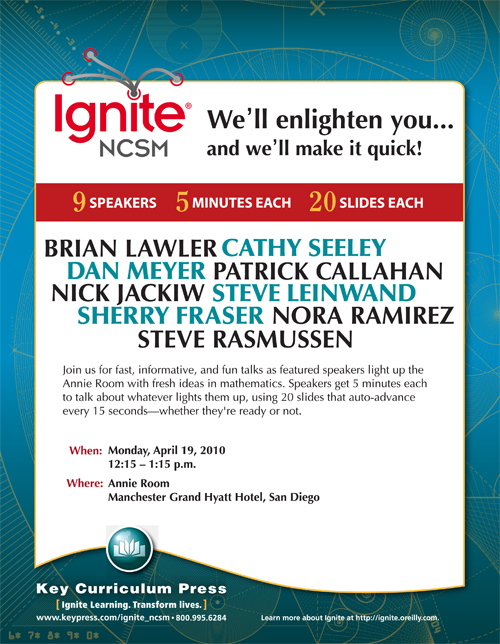 Ignite NCSM! Ten Speakers Light up the Room with Fresh Ideas in Mathematics. Various. Using Video Clubs as a Vehicle to Link Instruction and Student Learning. Jim King, Nicole Bannister. I’m adjusting to new naming conventions at this conference. The term “teacher” refers to (variously) a teacher supervisor, a math coach, or, more traditionally, a teacher of math students. I have found it extremely useful to simply stop caring about the difference. We are learners and everyone in our community is a learner. We’re excited to be here learning. This is what has kept us strong. Would you attribute that quote to a) a teacher of students, b) a teacher of teachers, or c) who cares — it’s awesome! Take care of yourself. Take care of each other. Share your gifts. See earlier comment about the pointlessness of attribution. 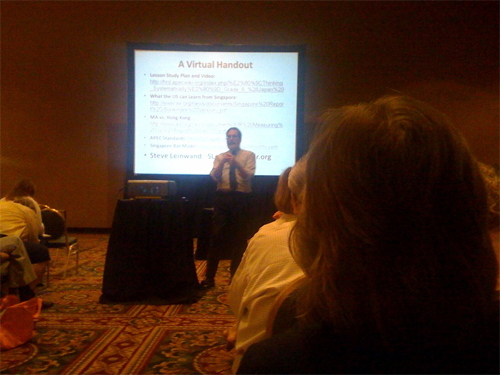 My favorite sessions today addressed the question: how do you talk to teachers about their teaching? “You don’t ask teachers that question,” he said. Everyone else nodded. I saw this again in the session on video clubs, where the norms were explicit and intense. You do not simply throw some teachers in a room and a video on the wall and tell them to talk about it. A university adviser helps two teachers select and crop a clip. Thirty teachers gather and eat food. Camaraderie is key. A facilitator prefaces the clip. What is the math? What might be hard about teaching it? What might be hard about learning it? The group watches the clip. The group discusses the clip. And when you’re discussing the clip, make sure your comments are respectful of the teacher but also of the students. Do not evaluate the teacher or the lesson. Evaluate instead what the students understand. Always cite evidence from the video. Comments of the form “I would have done [x].” are discouraged whereas comments like “I noticed [x] and I wonder if doing [y] would have resulted in [z].” are tolerated. Barely. Just watch yourself, okay? The norms are printed and distributed to everybody. The speakers noted how uncomfortable everyone becomes whenever a newcomer joins the group and starts tromping all over this shared code. Imagine someone who doesn’t understand that the library is a place where silence is an expectation. A large part of me wants to urge teachers to just get over all of this, to convince them this job is too difficult and too important, that we all have too much to learn to get hung up on our feelings. But check it out: the club has been running for seven years; there is little turnover; it has only grown; and its teachers are becoming huge and powerful. All of this recommends staying (at least a little) hung up on feelings. My mind wandered, as it does twelve times a session here, to a) the internet and b) the lack of equity for teachers who can’t attend that video club and c) how (a) could render (b) totally insignificant. You had one hundred people in the room and eighty people trying to get in. The speakers had to give up their chairs and sit on the floor. Clearly, this is a crowd-pleaser, and something you ought to think about for your own conference. (Huge props to CMC-North, my regional math conference, for picking up the format for their next conference.) The investment is negligible and the upside is huge. Brief recaps follow. All the talks are available (or will be soon) here. Brian Lawler, Professor of Math Education at CSU San Marcos, said, “As humans we are all mathematical, so why are so few of us deemed proficient in math?” He suggested the idea of mathematics as a tool of oppression and, man, I’m tutoring a neighbor in second-year algebra lately, a class that’s farther from her aspirations to radiology than archery, and there we are, learning to add rational expressions, pushing cryptic symbols around, and it’s hard not to find Lawler’s argument compelling. 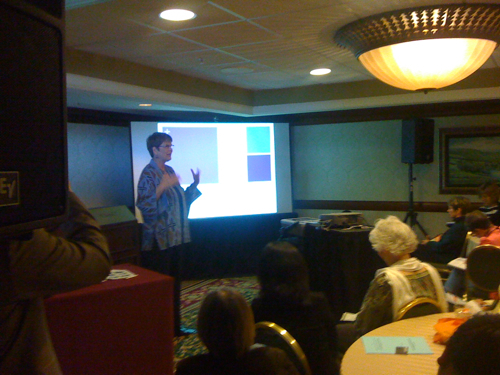 Cathy Seeley, former President of NCTM, asked why we don’t teach teachers the same way we tell them to teach students. She asked teacher educators to walk their talk. Patrick Callahan, co-director of the California Math Project, brought down his fists of fury on Algebra, opening with a reference to Swift, leading into his own modest proposal: “teach more geometry; teach less algebra.” He noted that three out of four California students fail Algebra yet we’re pushing more students at a younger age into a subject that fewer teachers know how to teach. When these Ignite talks go online, do not miss Callahan’s. Sherry Fraser, author of the Interactive Mathematics Program, reviewed the 31-year history of IMP (a curriculum that the parents in my community ran out of town at the end of a pitchfork the year before I arrived, just by the way). She showed old video interviews of the first group and then, using LinkedIn and Facebook, updated us on their status. (They’re doing awesome, in case you missed where that was going.) Loved the bit from the kid who went on to win Best Original Screenplay at Tribeca recently: “When you’re fast, you can play any sport; when you know math, you can do anything.” Say word. Steve Leinwand, principal research analyst at AIR, presented “The Gospel According to Steve,” which is beyond my powers of summarization. Mostly. The five pillars of his gospel are a) dignity, b) transparency, c) collaboration, d) quality, and e) accountability. His elaboration, though, is out of my range. Check the video. Nick Jackiw, inventor of Sketchpad, gave a talk on the history of geometry that didn’t conform to the medium or length of the Ignite format but no one seemed to mind because he’s Nick Jackiw, inventor of Sketchpad. The lack of wireless at both conferences is confounding. About the same time the laptop users are scavenging for outlets, I’m at 78% battery. I loaded all my conference PDFs into GoodReader, which meant I could (smugly) bypass the entire conference bag experience. Bulleted lists and HTML, more generally, are a chore on the iPad. A lot of conference blogging. The national conferences for both math teachers and math supervisors are in my state this year. Generally speaking, I’d still take a pass but a miraculous coincidence of funding and timing was tough to ignore. Key Press is covering travel in exchange for one of those five-minute Ignite sessions and Friend Of The Blog, Ihor Charischak, hooked up a spare registration badge. Plus, my school is enjoying the full battery of standardized tests this week so, clearly, the universe wants me in San Diego. I’ll toss out a single daily dispatch, probably nothing more. 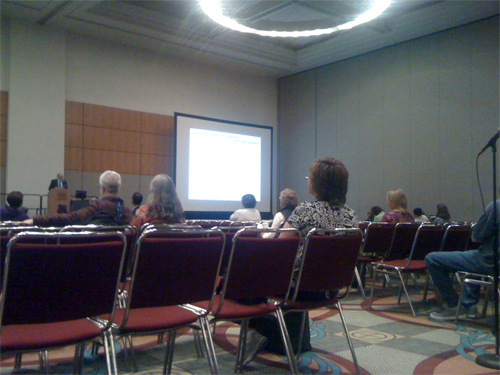 Gratuitous technical note: I’m going at this one iPad only — both for blogging and presenting. The experience typing this out in the San Jose airport has already been plenty annoying (owing mostly to the lack of copy/paste in the WordPress app) so I wouldn’t be surprised if these daily dispatches turn into something less than daily.